UK, 1982, 85 minutes, Colour. Julie Covington, Ian Charleson, Susan Engel. 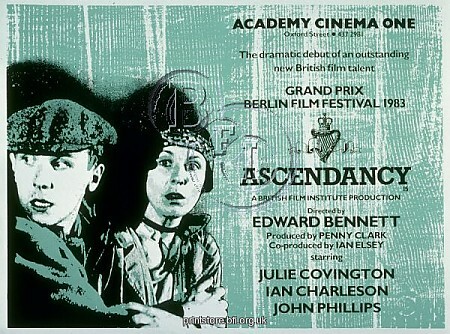 Ascendancy is a production of the British Film Institute. The setting is Belfast in 1920, the aftermath of World War One. It is the beginning of the troubles. The central character is Connie Wintour (played effectively by singer Julie Covington), the daughter of a Protestant shipyard owner. She has withdrawn from life and is a symbol of the illness of Northern Ireland. Her father is successful in politics, the Protestant- Catholic violence escalates, the divisions between Protestant and Catholic are seen in terms of areas of Belfast, possibilities of work. Into the situation come the British (here personified by Ian Charleson - Chariots of Fire). The film dramatises the period, highlights the troubles, asks the audience to identify with its ambiguous heroine and her perspective on the troubles. There are no answers offered by Bennett - and the film ends with violence, depression and the prospect of continued decades of trouble. 1. Audience interest in the Irish troubles, Belfast 1920? Interest, enjoyment? The quality of the writing, the production? Message? 2. The production of the British Film Institute, viewpoint, critique? 3. The small budget, the cast, the English locations for Northern Ireland? The re-creation of the period, detail and atmosphere? The city, the stately homes, the streets, the docks, the Catholic suburbs? Belfast work, society, the military presence? The action sequences? The score? 4. The structure of the film: Protestant society, the introduction to Connie, her coming home, her illness, her relationship with her dead brother, father? The changes in Belfast? The introduction of the military? Connie's going out into the streets and the impact of the violence? The episodic nature of the film? The indeterminate ending? 5. The background of World War One, the involvement of the British? Catholic Ireland and the British? The Germans? The true war within Ireland? The claiming of God for each side? The victory of Britain in World War One? Volunteers, Connie's brother, his death? Her sense of betrayal? 6. The introduction to Connie, the voice-over, her secrets? Talking to her brother, the letters? Her illness, psychosomatic? The strong nurse in charge of her - and the detail of her care, feeding her, combing her hair...? The maids and her relationship with Rose? The doctors and their visits, the attempts at treatment? The hypnosis and her raising her arm? Her fantasies and being slapped? The doctors and their reaction, her reaction to the betrayal of her brother? Society? Her reading, dressing in black, her age and appearance? Her relationship with her father, critical? With Rose? Her beliefs? Her secret writings and hiding her letters? The presence of the military in the house, attracted to Ryder? Inviting him to her room, trying to explain and his resistance? The key? The parties, the dead soldier? Her fright, going out into the streets, the experience of the riots, the shootings? The interaction with Ryder, his return, his talking to her but unable to move her, burning her letters? Going into the church and the experience for Connie of the church? Her final illness, her catatonic state, the movement of her eyes, Ryder unable to change her? The confrontation - and her being force-fed? Her future? A symbol of Northern Ireland? 7. The depression and the letters, the revelation, the guilt and the sharing, taking on the burdens? Guilt and accepting of guilt? The collapse? Tradition, ignorance? A basically good person, the burden of her inheritance? 8. Wintour and his position, the Orange March and its pomp? His mansion, money, lifestyle? The docks, the German contracts? The pledges, his stances? The workers and the riots? The Catholic dock workers and employment? Rose in his household? Concern, elections, the parliament? His relationship with Ryder, the military in his home? The barricade after the death? The siege and his reaction? His bewilderment towards Connie? 9. Ryder and the British, the attitude towards the war, his explanation to Connie of what he expected from a war and the situation in Ireland not being war? His style, the girls? The military style, the shootings? Proper, training, the volunteers? The friendship with Connie but his resistance to her ideas? Glad to leave? The visit to the home, finding her letters, challenging her by burning the letters? His failure? 10. The nurse, her presence, supervising Connie, her severity, her tenderness? 11. The maid, the bond with Connie, Catholic and Protestant? The glass, the trick? 12. The portrait of the workers, Catholics, Protestants? Strikes, contracts? The shootings in the street? The contrast of the world of the Belfast streets with Connie's world? 13. The British military, their presence, the reasons, the Protestant aristocracy? The futility for the British? 14. A mirror image of Belfast 1920? Subsequent decades? The difficulties of resolving the troubles?